If you ever watch Jeopardy, then you’ll understand that the title of this blog would fall under the category “Before and After”. The clue would be something like, “Movie set on the 110 mile tidal estuary with Connecticut to the north, and Long Island to the south where the Von Trapp Family children pick Edelweiss and are taught their Do Re Mis by a problem like Maria.” “What is ‘Long Island Sound of Music’ Alex? !” (If you don’t know The Sound of Music, none of that made sense to you – move on.) Well, it seemed fitting because there was music intertwined heavily through this part of the trip! We pulled out of Pt. Washington, looked to our left to wave goodbye to the city in the distance, then turned hard to starboard and headed east on the Long Island Sound. Our next stop was Pt. Jefferson… the next logical stop when you’re headed that direction. We’ve never paid “Pt. Jeff” any mind… just used her and discarded her. It is a very nice, secure, protected place to anchor and that’s what we’ve done – anchored, stayed on the boat, gotten up the next morning and run without so much as a “how do you do.” And yet we’d heard people talk about what a delightful little town it is. It was time to stop dissin’ Pt. Jeff and go see what was happening there. We knew we’d be tucked in for two nights because weather was moving in, but the afternoon we arrived was beautiful! So we took off in the dinghy and went to Pt. Jeff. What we found was a vibrant little shore town with restaurants, shops and live music. We’ll remember the live music – some in a good way and some not so much. The bad live music: Okay, we’re not even sure where this was coming from, but somewhere there was outdoor karoke that could be heard for blocks. And some unfortunate soul who had clearly had a few adult beverages too many was belting out (VERY badly) Bon Jovi’s “Livin’ on a Prayer”. You can hear it, can’t you? I mean, people for blocks were cracking up at this guy, and I’m sure he had no idea just exactly how far his voice was being amplified. We passed a very cool looking older dude who was shaking his head – and we shook ours back – to which he responded, ‘Hey, at least he’s trying!” Good point, my man. The good live music: We landed at an outdoor bar to sip a brew and listen to a guy singing and playing acoustic guitar. Fun live music at the harbor. This man had a challenging assignment: perform music that would appeal to ALL the age groups in the audience which ran the gamut. When we tell you this guy could play/sing songs from every decade since the ’50s, that is no joke. That’s impressive and he was good. And when he had two sides of the audience facing off about which decade to cover next, he killed two birds with one stone: He sang a song that was a hit in the 60s and then redone by Pearl Jam in 2000, and it is the world’s most depressing song ever. Okay, I won’t make you guess at this one: “Last Kiss” was made a hit in 1964 by J. Frank Wilson and the Cavaliers – then the Pearl Jam success. For some reason, Frank knows every word to that song. Every single one. “Oh, where oh where can my baby be? Uplifting, right? Anyway, we thoroughly enjoyed listening to this guy sing. The best kind of live music: Frank playing guitar in the cockpit. Except that he had this depressing song stuck in his head now, so he of course had to pull a guitar tab up for it and (since he knows EVERY word) I listened to the tragic story of the car wreck and his baby going to heaven for quite a while. Apparently, birds like sad love songs, because they started showing up. Now, when we were last in this same anchorage, Frank made friends with the swans. He named them what he names all animals that need a name: Bubba. (Ask my great niece who now calls Frank “Uncle Bubba” after a lengthy discourse about everything being named Bubba.) So how many years has it been since we’ve been in this spot? And guess who comes up to the side of the boat… Mr. and Mrs. Bubba! They heard Frank was back in town and knew that meant good eatin’!! When he tired of hand feeding the Bubbas and getting his finger nibbled on, he went back to the guitar. Seagulls gathered. 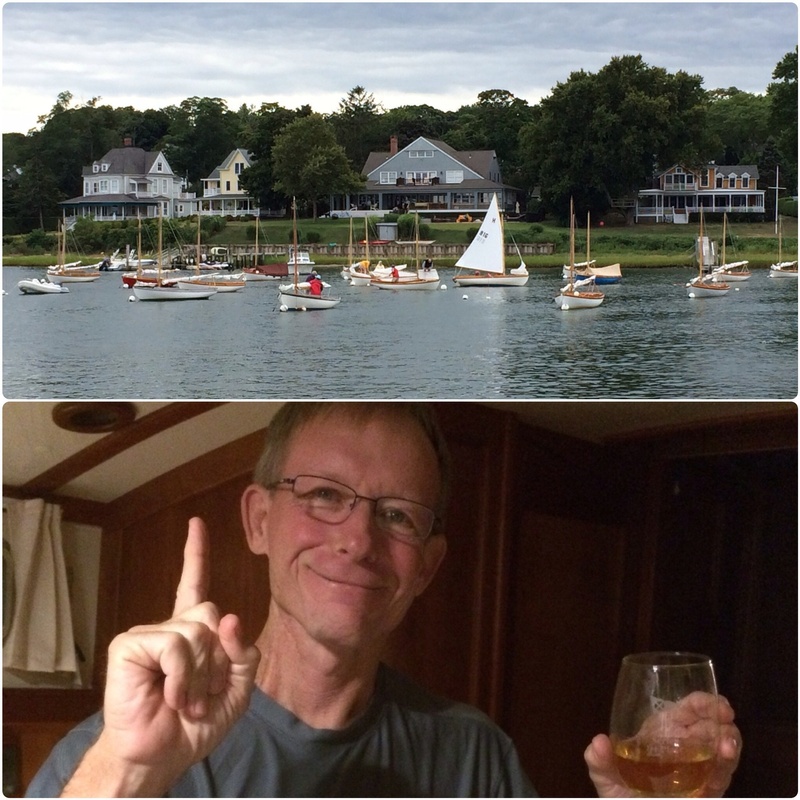 The next day was supposed to be a washout, but when we woke up, we looked at the radar map and discovered we had a couple of hours of dryness, so we explored a different dinghy dock that dropped us in the less touristy town of Setauket. After about a 5 block walk to Main St., we explored the store fronts and restaurants. You know, stop by the barber shop and the violin shop all in one trip. Pretty convenient. And even better, we found a barber shop!!! (Sorely needed if you ask me.) It was the classic, throw back barber shop – and Frank got a mighty fine hair cut there! Afterwards, a quick trip to a local deli for lunch and then – oops – we didn’t quite make it back before the precipitation. Hey, that’s what foul weather gear is for. We got a little soggy on the walk/ride back, but no big deal. We were back on the boat for the rest of the day enjoying the down time after our hectic travels so far. A day of reading, cards and a little dinner on the boat in the middle of a rainy, peaceful anchorage is quite delightful. I actually really like those days peppered into our other experiences. We did get a little break in the clouds later! 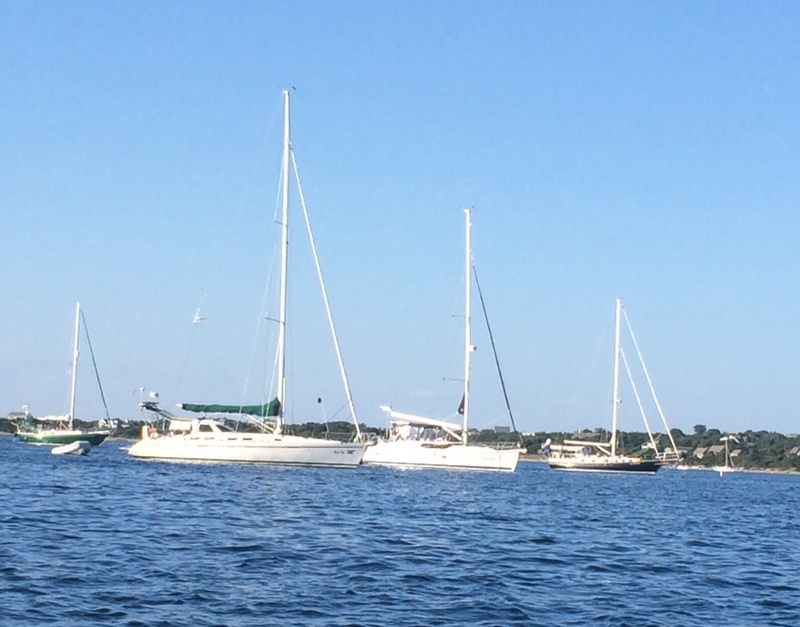 Next day we were back out on the Sound heading to Shelter Island – one of our favorite places. We have friends there who we met on our first visit – we have the same make of boat which automatically makes us cousins. We always look forward to meeting up with them. One of the things we MOST enjoy is playing music together, as our friend is an outstanding guitarist and all around musician and likes to rock out. We have a blast playing classic rock, folk and a little country together and were able to have two jam sessions at their house while we were in town. They’re jammin’ – hope you’re jammin’ too. 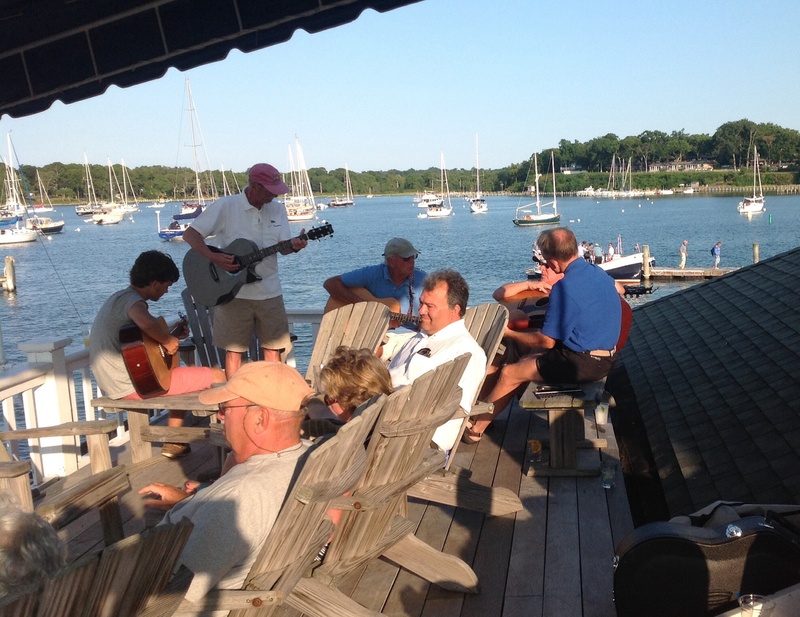 And Shelter Island Yacht Club is a beautiful place to hang out! Oh, did I mention we are back in the land of the canon? 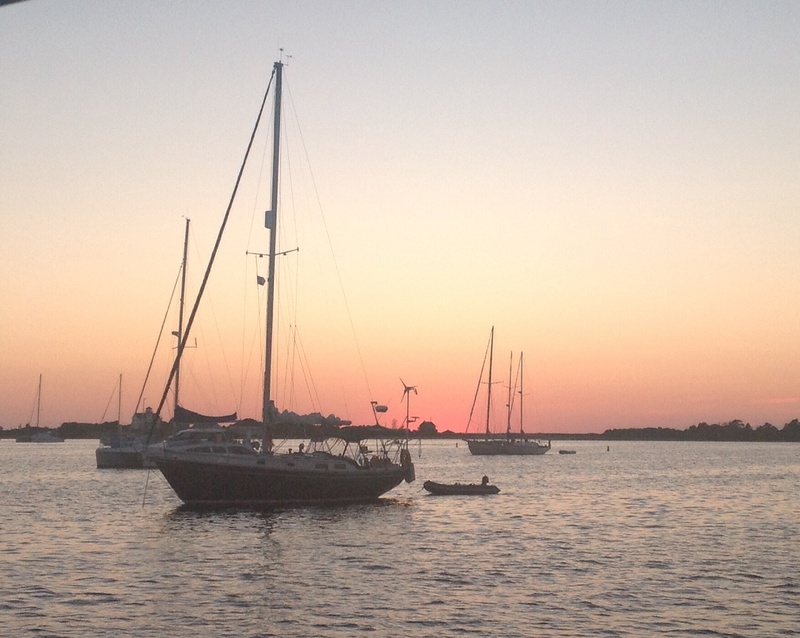 The yacht clubs from NY north seem to share the tradition of setting off a canon at 8:00am and sunset – and also observing “colors” which is the lowering of the flag at day’s end while everyone stands quietly at attention. It is actually a very cool tradition that is observed all over NY and New England. And our friends were very generous to let us use their second vehicle to get around the island a bit, so we took advantage and did some grocery shopping and – went to a concert!! Yay – more music! 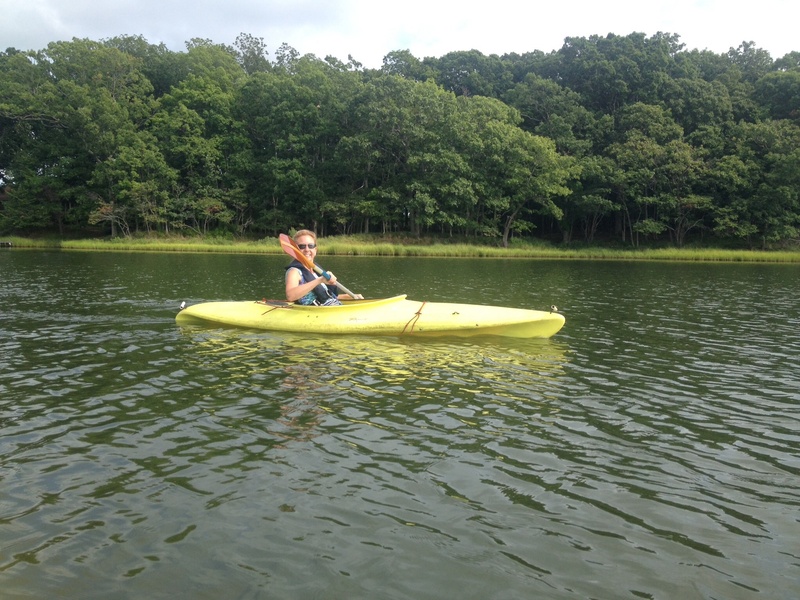 The last time we were in Shelter Island, I was able to convince Frank to come with me to the Perlman Music Camp. Itzak Perlamn and his wife started this camp for gifted young musicians. Only the finest up and comers get into this camp and they offer frequent concerts throughout the program. Last time was a special concert that Mr. Perlman performed in as well – that was unique! This time we saw a “Works in Progress” concert – performances by a number of the campers. Most of them could go pro now. UN. BE. LIEVABLE. We will be interested to see how their careers take off! The setting is basically a tent that holds about 200 people with a stage up front, so the sound of crickets and cicadas is part of the accompaniment, too. It is truly special. Great concert. On a completely separate side note – we were happy to find that Frank’s #1 Choice for best milkshake can retain its titile… The Islander Cafe – hands down. 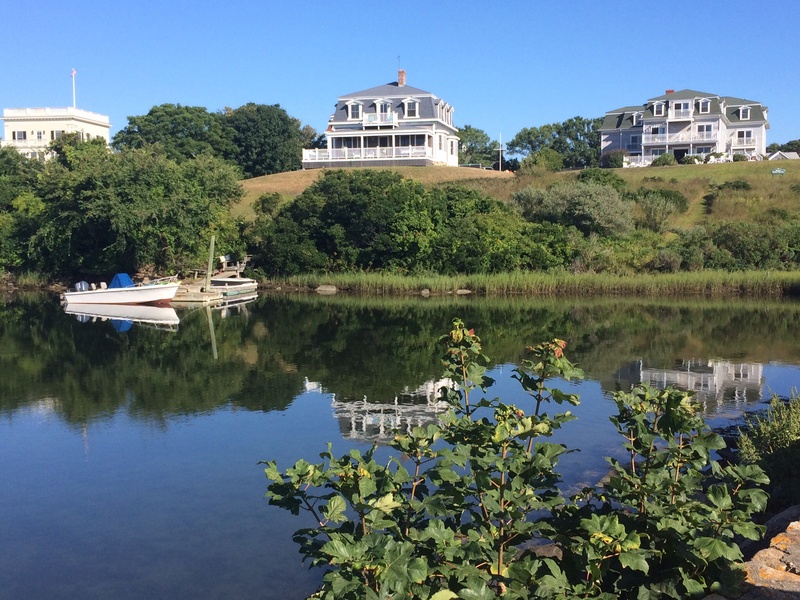 One morning we decided to take the short walk from the dinghy dock to the Greenport Ferry and have breakfast in that cool little town. Love the ferry ride. Found “Crazy Beans” for breakfast again – just as tasty as last time – then expected a typically pleasant and uneventful 15 minute ferry ride back. Instead, we got a really crappy ride – literally. Look what they loaded onto the ferry with us. Now understand, this ferry is SMALL! It does take vehicles, but not many – maybe 20? And the pedestrians or bicyclists just stand around the cars – not like there is an inside cabin to sit in – it’s very bare bones. So when we saw this trailer full of cows being loaded on, it made us wonder: should we wait for the next ferry? And the cows were NOT HAPPY about being rolled onto a boat which agitated them greatly. They truly were trying to kick their way out of the trailer. Now here’s the difference between Frank and I, ’cause you might remember, we’re different in some ways… he walks TO the trailer and I walk away from the trailer. Just change “pony” to “cow” and that was sort of our day. Kind of a stretch on the musical reference? Fine. So for now I’ll just say, “So long. Farewell. 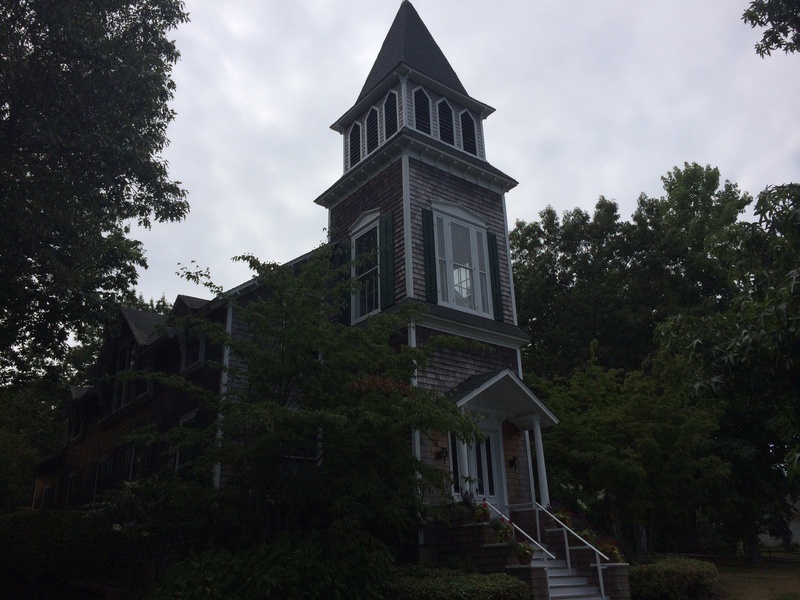 Auf wiedersehn, adieu.” Thank you Long Island Sound of Music. Last summer we spent a good deal of our time in Maine. We loved Maine. We’re thrilled we went to Maine. We have good friends that went to Maine this summer and are having a ball. But last summer in Maine was like eternal spring or early fall. We were in long pants more than shorts. The weather was sketchy a good 40% of the time. Even the Mainers were saying it wasn’t the best of years from a weather perspective. Our strategy for this summer: focus more on New York, Rhode Island, Massachusetts and Connecticut. And so far it’s been a great strategy! Pure summer. Delightful warmth. Eternal sunshine. 78 every day, 62 every night (plus or minus or a few degrees). Seriously – I can’t remember experiencing a stretch of weather this consistently nice. If you live in California, you’re used to this. Those of us on the east coast – not so much. 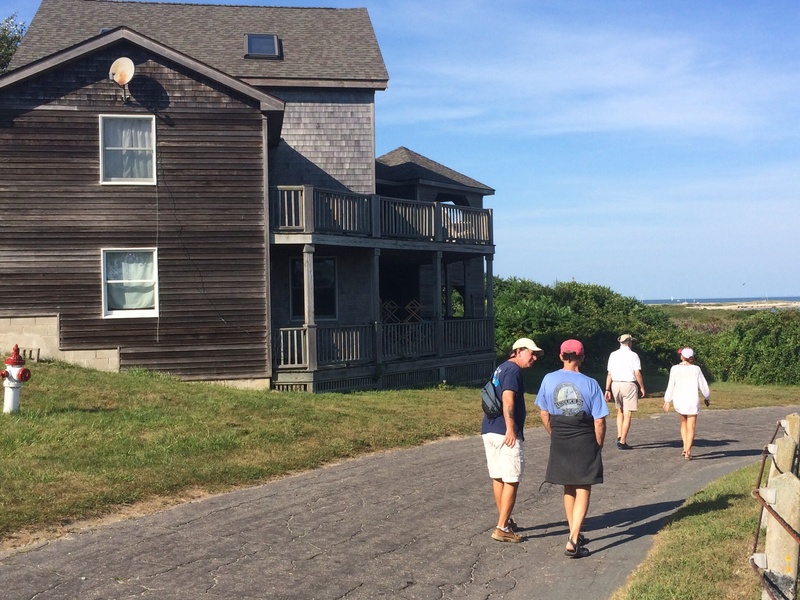 We’ve hit some great locations in the last couple of weeks: Shelter Island, NY (a favorite), Block Island, RI (we gave it another chance), Cuttyhunk, MA, Hyannis, MA and Nantucket. 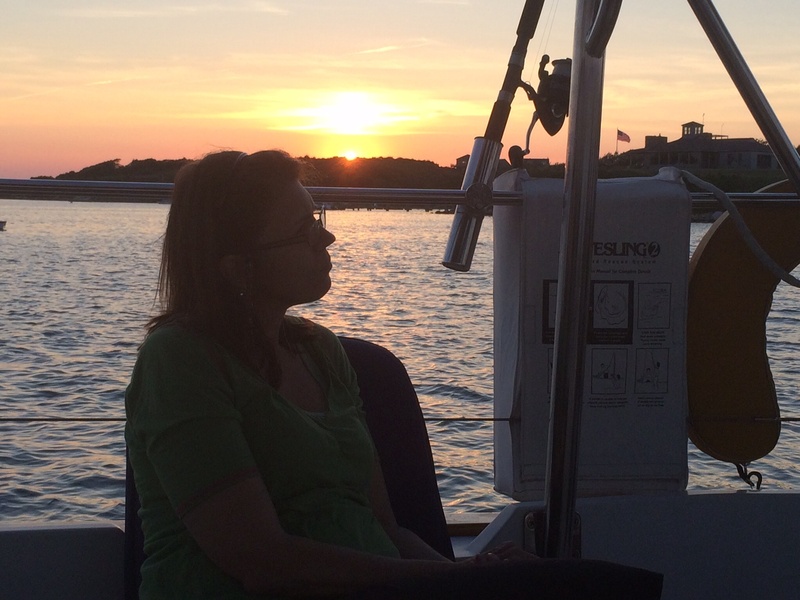 We’ve traveled on the Long Island Sound, Block Island Sound, Rhode Island Sound, Vineyard Sound and Nantucket Sound. It’s been a “sound” decision to be sure. We’ll cover the first three in this post. 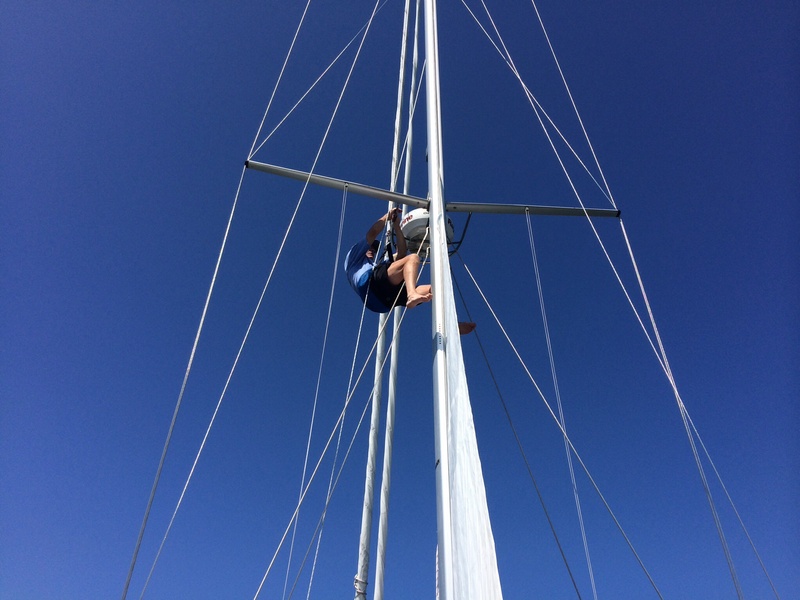 Frank helping out with some work up the mast. He’s like a monkey! And yes, Frank taking pictures while he’s hanging out in the mast. The four of us kayaked in one of the creeks . . . even harvested a mussel or two. They were so kind as to loan us a set of wheels to tour around the island. 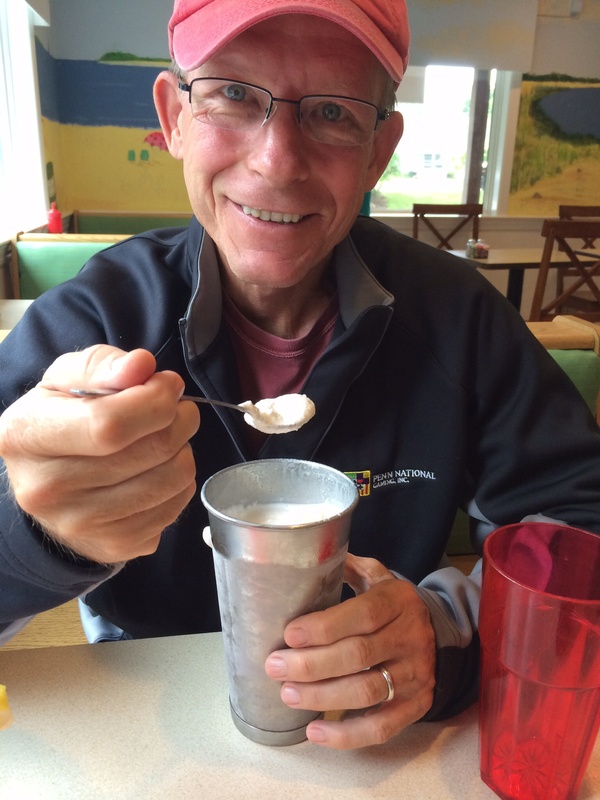 Frank declared this the best vanilla milkshake EVER at a burger joint we found in town. Who needs the glass??? For those of you out there who might watch the Food Network from time to time, there is a show called, “The Best Thing I Ever Ate.” I catch it on occasion. 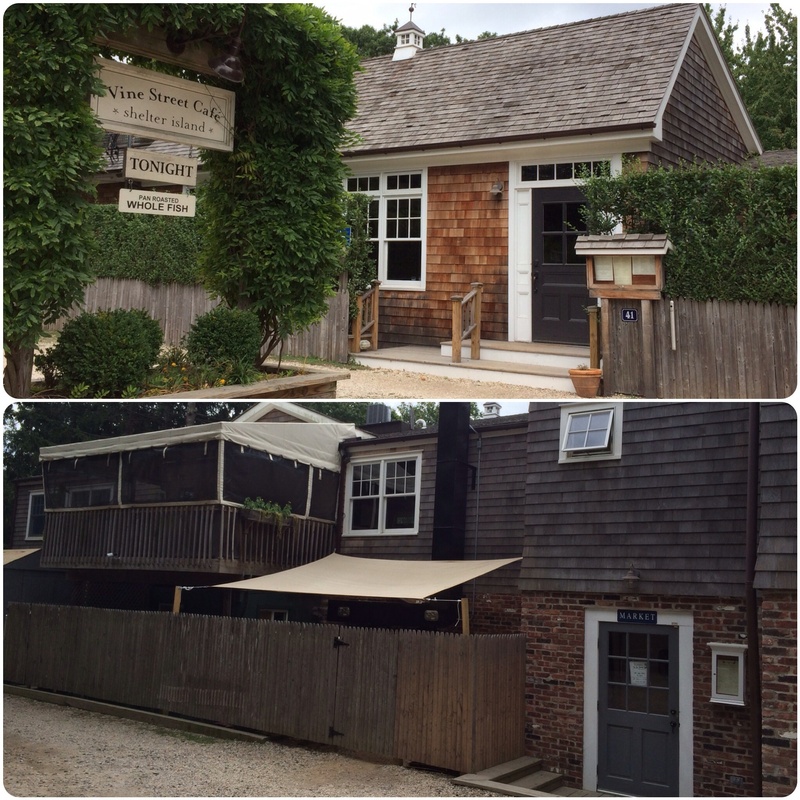 Last year I saw an episode, and Ina Garten – aka the Barefoot Contessa – shared that the best bolognese sauce she ever ate was from the Vine Street Cafe in Shelter Island. I read that they had a market where you could buy said sauce. So while we had the wheels, we went to the middle of the island to hunt. Sure enough – there was the Cafe – which was closed. BUT – there was a sign pointing around the back of the building to the Market. It was closed. BUT! There was, what appeared to be, one of the chefs walking by in his whites. He assured me that he could rustle someone up to open the market for us if we would pay by credit card and not cash. No problem!! And so, I got my hands on two containers of fresh bolognese sauce. I thought it was very tasty, indeed. I kind of forgot (or chose to for the moment) that Frank really doesn’t care for bolognese sauce no matter how good it is. So please don’t tell the chef at the cafe that I may be thinning out the second container of meat sauce with some extra tomatoes for Frank. Shhh. It’s just between us, okay? Vine St. Cafe – In search of bolognese sauce! Our last trip to Shelter Island included Frank joining our friend as crew in a Herreshoff doughdish race at the Yacht Club. The two of them won that race last season! Could they repeat?? Winners again! Frank sipping a little Jamesons out of his new wine glass trophy! They were first in a field of 25. 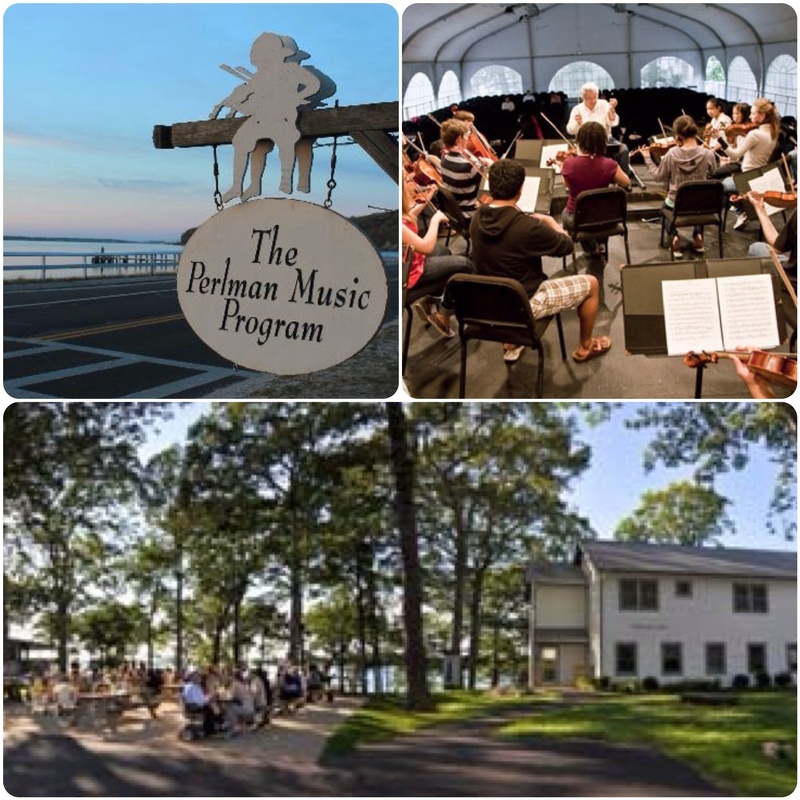 The Perlman Music Program on Shelter Island. Pictures borrowed from their website because I was too dumbstruck to take photos that night! camp. Not this year! I gave Frank the chance to do something on his own that evening, but he was interested in checking it out with me. And so we gathered in the “Performance Tent” that seats about 300 people. It is much more of a permanent tent-like structure that is somewhat open air, but permanent enough to support pieces that are necessary to have great acoustics. 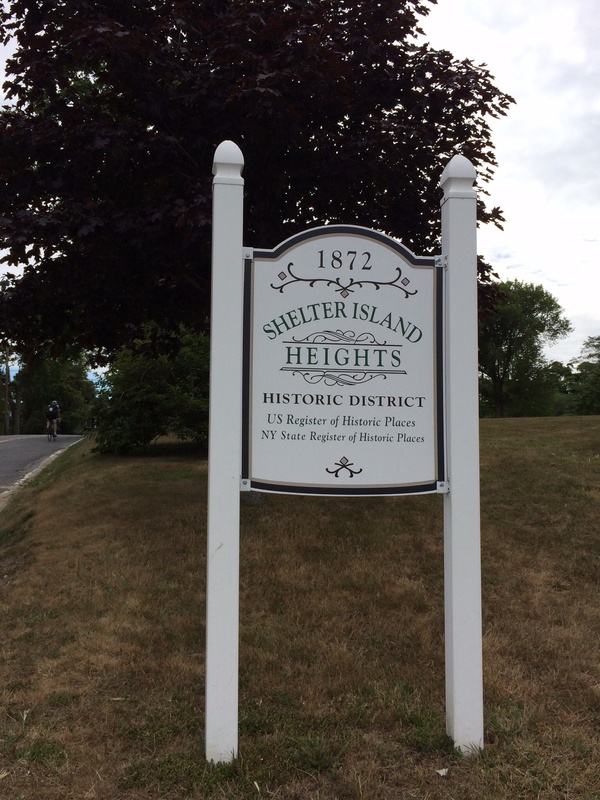 The camp had ended the week before – this concert was a thank you to the community of Shelter Island and was free to the public. And so, on a beautiful summer evening, we enjoyed 90 minutes of chamber music presented by a combination of students, faculty and alumni of the program. Mr. Perlman himself performed on two of the pieces. Special guest performers that evening were the accompanying cicadas and tree frogs. It was a very special evening. If you’re interested in learning more about the Perlman Music Program, go to http://www.perlmanmusicprogram.org. 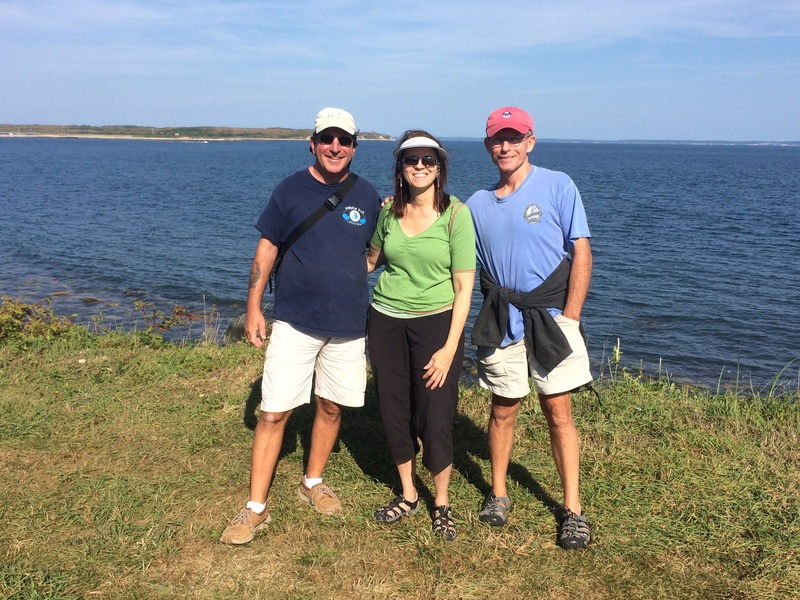 After four great days, we reluctantly moved on to Block Island. Yeah, I kind of dissed Block Island last year. We were there close to 4th of July and it was crowded and noisy . . . and the weather wasn’t great . . . and we liked some things about it but didn’t feel the need to race back. But as the winds would have it, it really was the perfect location for our next stop along the way. So . . . we stopped again. This time we were smart and anchored instead of taking a mooring ball in the crowded field. The anchoring there is good and plentiful and it was quite delightful being on the edge of the mooring field. We only stayed one night, but enjoyed our afternoon taking a nice, long walk. The further away you get from the main harbor’s mayhem, the prettier the island gets. Block Island . . . you’re not so bad after all. Entering Block Island . . . again. Pretty scenery in Block Island. Ferry Landing at Block Island. 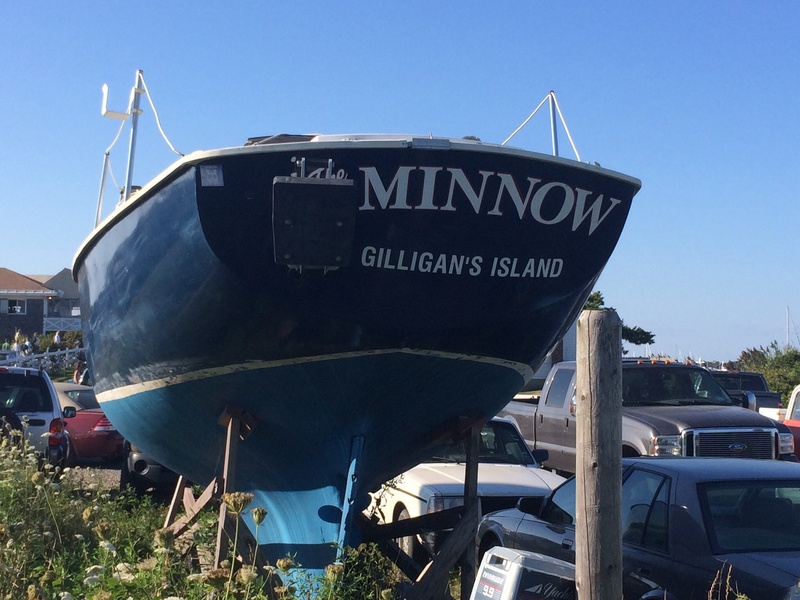 Happy to see that The Minnow still is found. Happy to be in the anchorage. As we plotted our next stop, the winds and the currents had a big influence. 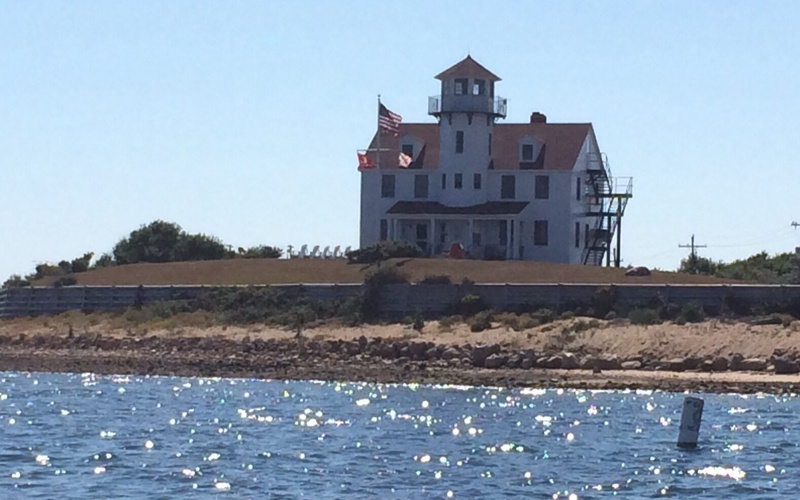 We had thought we’d go straight to Martha’s Vineyard from Block Island, but alas, the timing of the currents was not in our favor. 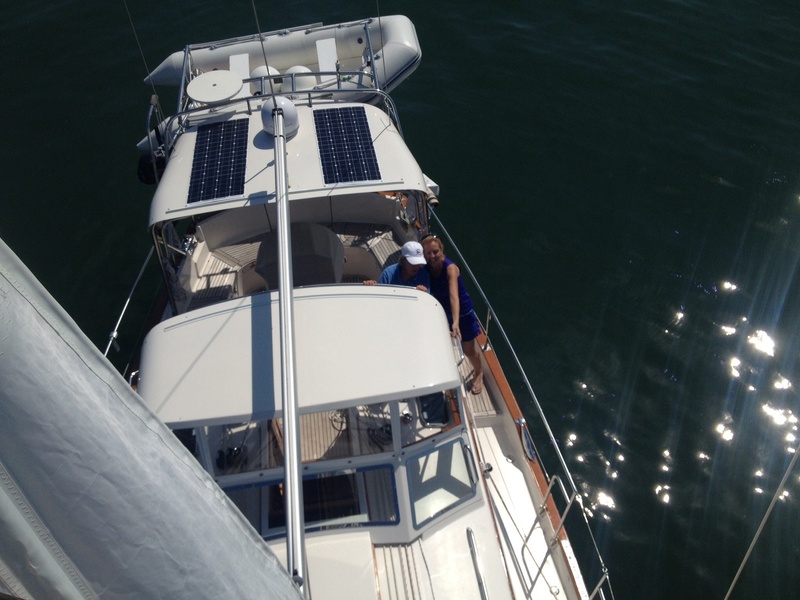 The current in Vineyard Sound can run around 2.5 knots against you . . . there is no point to do that to yourself. That’s going nowhere fast and it’s not much fun. 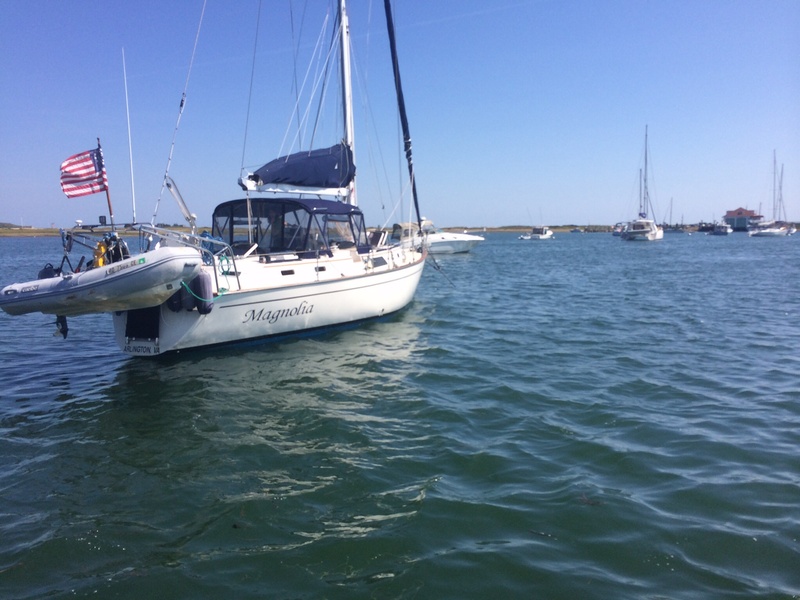 So we adjusted our plan to head to Cuttyhunk – a stop we had made last year. It was a “middle of the pack” stop for us . . . . a beautiful place that is worth seeing once, but not a whole lot to come back to time after time. But the location was perfect. Here’s what made it perfect – we figured out that we could intersect with our buddies on Magnolia there!!! Excellent! 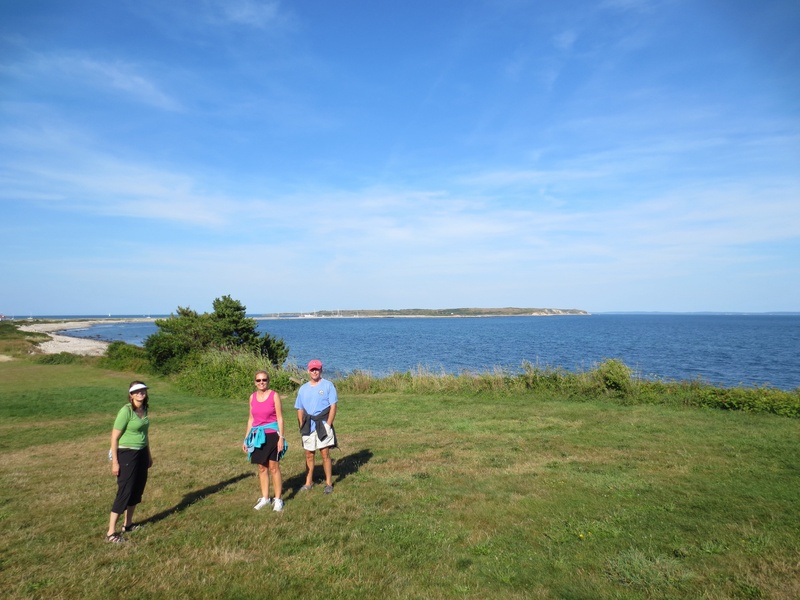 They had set off for Maine this summer and were now on their return trip – and here was an opportunity for our paths to cross. We all arrived in the early afternoon and spent the day catching up, walking, eating, sipping and laughing. Good to be back together again! The guys engaged in heavy conversation during our walk, or so it appears. Pretty landscape at Cuttyhunk. Photo by Anthony. Hanging with some of the water family!